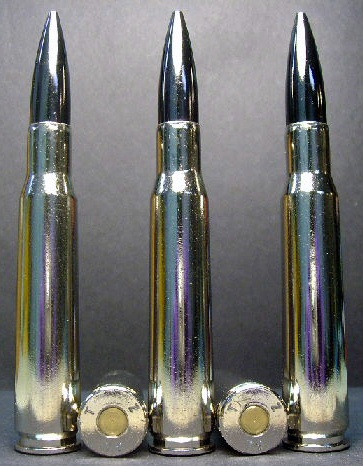 Home :: Rifle Ammunition :: .50 BMG :: .50 BMG cal. M-2 Armor Piercing - Black Nickel (5ct.) RARE! 5ct., .50 BMG cal. 700gr. M-2 A.P. ammo - Black Nickel. Re-manufactured in the U.S.A. by the former Cascade Cartridge Co. These rounds were loaded to mil.-spec. with virgin, Israeli NICKEL brass, L.C., hand-pulled, BLACK NICKEL A.P. bullets, new powder and new primers! Packaged in a plastic, vacuum sealed pack. The casings and especially the bullets used are extremely rare!